This Bigsby-equipped blues workhorse could be yours! 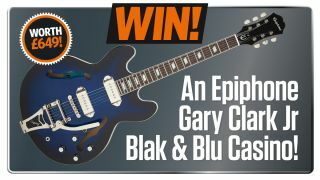 Gary Clark Jr has rejuvenated the blues over the past couple of years - his combination of traditional influences, gritty tone and contemporary sounds has helped to push things forward, and this is very much reflected in his Epiphone Blak & Blu Casino signature model. Taking the tradition of the Casino's fully-hollow maple body, classic P-90 pickups and (in the case of our competition guitar) a Bigsby vibrato, and merging it with a super-sleek Blueburst finish, and modern 18:1 Grover tuners, Gary has created a snarling blues-rock beast. We checked out the Blak & Blu back in TG273, and loved it enough to give it a TG Best Buy Award, and our pals at Epiphone have given us one to pass on to one lucky reader.